An electric car is an alternative fuel automobile that uses electric motors and motor controllers for propulsion, in place of more common propulsion methods such as the internal combustion engine (ICE). Electric cars are specifically a variety of electric vehicle created or adapted for use on the road. Electric cars are commonly powered by on-board battery packs, and as such are battery electric vehicles (BEVs). Other on-board energy storage methods that are expected to come into use in the future include ultracapacitors, fuel cells, and a spinning flywheel which stores kinetic energy. Electric cars enjoyed popularity between the mid-19th century and early 20th century, when electricity was among the preferred methods for automobile propulsion, providing a level of comfort and ease of operation that could not be achieved by the gasoline cars of the time. Advances in ICE technology soon rendered this advantage moot; the greater range of gasoline cars, quicker refueling times, and growing petroleum infrastructure, along with the mass production of gasoline vehicles by companies such as the Ford Motor Company, which reduced prices of gasoline cars to less than half that of equivalent electric cars, led to a decline in the use of electric propulsion, effectively removing it from important markets such as the United States by the 1930s. In recent years, increased concerns over the environmental impact of gasoline cars, along with reduced consumer ability to pay for fuel for gasoline cars, has brought about renewed interest in electric cars, which are perceived to be more environmentally friendly and cheaper to maintain and run, despite high initial costs. Electric cars currently enjoy relative popularity in countries around the world, though they are notably absent from the roads of the United States , where electric cars briefly re-appeared in the late 90s as a response to changing government regulations. The hybrid electric car has become the most common form of electric car, combining a internal combustion engine powertrain with supplementary electric motors to run the car at idle and low speeds, making use of techniques such as regenerative braking to improve its efficiency over comparable gasoline cars, while not being hampered by the limited range inherent to current battery electric cars. Hybrid cars are now sold by most major manufacturers, with notable models including the Toyota Prius and the forthcoming Chevrolet Volt, a plug-in hybrid which uses a fully electric drivetrain supplemented by a gasoline-powered electric generator to extend its range. As of 2009, the world's most popular battery electric car is the REVAi, also known as the G-Wiz, which is produced by an Indian company and sold in a number of countries in Europe and Asia. Electricity is one of the oldest automobile propulsion methods still in use today. The invention of the electric vehicle is attributed to various people, including the Hungarian inventor of the electric motor, Ányos Jedlik, Vermont blacksmith Thomas Davenport, Professor Sibrandus Stratingh of Groningen , the Netherlands , and Scotsmen Robert Davidson and Robert Anderson. The invention of improved battery technology, including efforts by Gaston Plante in France in 1865, as well as his fellow countryman Camille Faure in 1881, paved the way for electric cars to flourish in Europe. France and the United Kingdom were the first nations to support the widespread development of electric vehicles, while the lack of natural fossil resources in Switzerland resulted in the rapid electrification of its railway network to reduce its dependence on foreign energy. English inventor Thomas Parker, who was responsible for innovations such as electrifying the London Underground, overhead tramways in Liverpool and Birmingham, and the smokeless fuel coalite, claimed to have perfected a working electric car as early as 1884. Before the pre-eminence of internal combustion engines, electric automobiles also held many speed and distance records. Among the most notable of these records was the breaking of the speed barrier, by Camille Jenatzy on April 29, 1899 in his 'rocket-shaped' vehicle Jamais Contente, which reached a top speed of . Before the 1920s, electric automobiles were competing with petroleum-fueled cars for urban use of a quality service car. It was not until 1895 that Americans began to devote attention to electric vehicles, after A.L. Ryker introduced the first electric tricycles to the US, many innovations followed, and interest in motor vehicles increased greatly in the late 1890s and early 1900s. In 1897, electric vehicles found their first commercial application as a fleet of electrical New York City taxis, built by the Electric Carriage and Wagon Company of Philadelphia, was established. Electric cars were produced in the US by Anthony Electric, Baker, Columbia, Anderson, Edison, Studebaker, Riker, and others during the early 20th century. In 1917, the first gasoline-electric hybrid car was released by the Woods Motor Vehicle Company of Chicago. The hybrid was a commercial failure, proving to be too slow for its price, and too difficult to service. Despite their relatively slow speed, electric vehicles had a number of advantages over their early-1900s competitors. They did not have the vibration, smell, and noise associated with gasoline cars. Changing gears on gasoline cars was the most difficult part of driving, and electric vehicles did not require gear changes. Electric cars found popularity among well-heeled customers who used them as city cars, where their limited range proved to be even less of a disadvantage. The cars were also preferred because they did not require a manual effort to start, as did gasoline cars which featured a hand crank to start the engine. Electric cars were often marketed as suitable vehicles for women drivers due to this ease of operation. Acceptance of electric cars was initially hampered by a lack of power infrastructure, but by 1912, many homes were wired for electricity, enabling a surge in the popularity of the cars. At the turn of the century, 40 percent of American automobiles were powered by steam, 38 percent by electricity, and 22 percent by gasoline. 33,842 electric cars were registered in the United States, and America became the country where electric cars had gained the most acceptance. Sales of electric cars peaked in 1912. After enjoying success at the beginning of the century, the electric car began to lose its position in the automobile market. Factors including improved road infrastructure in the 1920s and the discovery of large reserves of petroleum in Texas, Oklahoma, and California paved the way for gasoline cars to gain popularity, with their longer range and newly-affordable fuel. Electric cars were limited to urban use by their slow speed and low range, and gasoline cars were now able to travel farther and faster than equivalent electrics. Gasoline cars became ever easier to operate thanks to the invention of the electric starter by Charles Kettering in 1912, which eliminated the need of a hand crank for starting a gasoline engine, and the noise emitted by ICE cars became more bearable thanks to the use of the muffler, which had been invented by Hiram Percy Maxim in 1897. Finally, the initiation of mass production of gas-powered vehicles by Henry Ford brought the price as low $440 in 1915 (equivalent to roughly $ today). By contrast, in 1912, an electric roadster sold for $1,750 (roughly $ today). By the 1920s, the heydey of electric cars had passed, and a decade later, the American electric automobile industry had effectively disappeared. Years passed without a major revival in the use of electric cars. While ICE development progressed at a brisk pace, electric vehicle technology stagnated. In 1947, the invention of the point-contact transistor brought about the creation of modern semiconductor controls and improved batteries; this led to new possibilities for electric propulsion. Within a decade of the creation of the transistor, Henney Coachworks and the National Union Electric Company, makers of Exide batteries, formed a joint venture to produce the first modern electric car based on transistor technology, the Henney Kilowatt. Despite the Kilowatt's improved performance with respect to previous electric cars, consumers found it too expensive compared to equivalent gasoline cars of the time, and production ended in 1961. Even though the Kilowatt was a commercial failure, its technology paved the way for the next generation of electric vehicles. On July 31, 1971, an electric car received the unique distinction of becoming the first manned vehicle to be driven on the Moon; that car was the Lunar rover, which was first deployed during the Apollo 15 mission. The "moon buggy" was developed by Boeing and Delco Electronics, and featured a DC drive motor in each wheel, and a pair of 36-volt silver-zinc potassium hydroxide non-rechargeable batteries. After years outside the limelight, the energy crises of the 1970s and 80s brought about renewed interest in the perceived independence electric cars had from the fluctuations of the hydrocarbon energy market. At the 1990 Los Angeles Auto Show, General Motors President Roger Smith unveiled the GM Impact concept electric car, along with the announcement that GM would build electric cars for sale to the public. In the early 1990s, the California Air Resources Board (CARB), the government of California 's "clean air agency", began a push for more fuel-efficient, lower-emissions vehicles, with the ultimate goal being a move to zero-emissions vehicles such as electric vehicles. Impressed by concept vehicles such as the Impact, CARB set guidelines that would require carmakers to make 10% of their fleets emission-free by 2003. In response, automakers soon developed electric models to comply with the new regulations; however, the automakers were widely accused of deliberate self-sabotage, failing to adequately promote their electric vehicles in order to create the false impression that consumers were not interested in electric cars, while fighting against the CARB mandate using lobbyists and lawsuits. Electric cars were expensive to develop and cost two or three times as much as equivalent gasoline cars to produce; as such, they were not a profitable enterprise for the car companies. In 2001, CARB removed its ZEV mandate, resulting in almost all production electric cars being withdrawn from the market, and in many cases destroyed by their manufacturers. In response to a lack of major-automaker participation in the electric car industry, a number of small companies cropped up in their place, designing and marketing electric cars for the public. In 1994, the REVA Electric Car Company was established in Bangalore , India , as a joint venture between the Maini Group India and AEV of California. After seven years of research and development, it launched the REVAi, known as the G-Wiz i in the United Kingdom , in 2001. In 2007, Miles Electric Vehicles announced that it would bring the XS500, a highway-capable all-electric sedan to the US by early 2009. California company Tesla Motors, hoping to gain a foothold in the electric sports car market, released the Lotus Elise-based Tesla Roadster in 2008. Throughout the 1990s, interest in fuel-efficient or environmentally friendly cars declined among Americans, who instead favored sport utility vehicles, which were affordable despite their poor fuel efficiency thanks to lower gasoline prices. American automakers chose to focus their product lines around the truck-based vehicles, which enjoyed larger profit margins than the smaller cars which were preferred in places like Europe or Japan. In 1999, the Honda Insight hybrid car became the first hybrid to be sold in North America since the little-known Woods hybrid of 1917. Hybrids, which featured a combined gasoline and electric powertrain, were seen as a balance, offering an environmentally friendly image and improved fuel economy, without being hindered by the low range of electric vehicles, albeit at an increased price over comparable gasoline cars. Sales were poor due to the lack of interest attributed to the car's small size and the lack of necessity for a fuel-efficient car at the time. The 2000s energy crisis brought renewed interest in hybrid and electric cars. In America, sales of the Toyota Prius (which had been on sale since 1999 in some markets) jumped, and a variety of automakers followed suit, releasing hybrid models of their own. Several began to produce new electric car prototypes, as consumers called for cars that would free them from the fluctuations of oil prices. The global economic recession in the late 2000s led to increased calls for automakers to abandon fuel-inefficient SUVs, which were seen as a symbol of the excess that caused the recession, in favor of small cars, hybrid cars, and electric cars. The most immediate result of this was the announcement of the 2010 release of the Chevrolet Volt, a plug-in hybrid car that represents the evolution of technologies pioneered by the EV1 of the 90s. The Volt will be able to travel for up to on battery power alone before activating an ICE to run a generator which then powers the electric motor. The batteries are recharged by plugging it into the grid. The Nissan LEAF, due to be launched in 2009, is the first all electric, zero emission five door family hatchback to be produced for the mass market. Lithium-ion battery technology, smooth body shell and advanced regenerative braking give the LEAF performance comparable to an ICE, a range of around 160 km and the capability to reach 80% recharge levels in under 30 minutes. Electric vehicles which store electrical energy in a capacitor or battery would not be able to immediately replace all gasoline cars given the available transportation infrastructure. For example, while a gasoline car could undertake a road trip which would require several short (around five minutes) fuel stops to complete, current electric car technology would not be capable of completing the trip in the same length of time; in addition to the limited range of current electric cars, they are not as quick or as practical to recharge. Even a practically comparable capacitor-based car, which would conceptually permit much faster recharging times than a battery car can, would require an electrical infrastructure that could "quick-charge" the car; provide a significant amount of energy, at very high current, to the car at its charging station, for a similar amount of time to that required to refuel a gasoline car. Today's infrastructure is suited to the slower charging cycle of battery electric cars, which must be parked for several hours while they recharge, making them suited for a commuter role but unsuitable for the long-distance driving which less frequent but still a factor in many markets. According to the documentary film Who Killed the Electric Car? the EV1 was "only" suitable for 90% of consumers. The unit of measurement known as miles per gallon of gasoline equivalent (MPGe) may be misleading if used to compare the overall fuel efficiency of electric and internal combustion vehicles. The MPGe formula uses the pump to wheels energy for gasoline, and the battery to wheels energy for EVs, ignoring the loss of power when charging a battery with AC. However, the MPGe formula for gasoline also ignores the fuel used to pump, refine and transport the gasoline to the filling station. Improvements to the electrical infrastructure could lead to mitigation of this issue; if charging stations were to adopt high-power connections to the electrical grid, and charge drivers by the kilojoule, supercapacitor-equipped electric cars could reach the goal of refueling in under ten minutes. It should be noted that this infrastructure change would be akin to the availability of cellular communications technology on a nationwide level; in the same way that rural locations are the last to receive access to high-speed data networks and up-to-date technology, those same locations would be the last to receive adequate electric-vehicle charging facilities. Being able to refuel in remote locations is necessary for a vehicle that is capable of undergoing long-distance, cross-country travel. The possibility to standardize replaceable battery packs should also be considered. The battery would be charged at the energy station over several hours and the vehicle's empty battery would be replaced with the fully charged one, for a fee covering the energy stored.Because of the weight (several hundred kilos), the vehicle and the energy station need to be adapted with a simple lift-and-slide-in mechanism to facilitate the replacement. It should not take longer time to switch batteries than filling up a gasoline car. A small car would use one battery pack, while a larger car might use several of the standardized battery packs. Other ways to mitigate the infrastructure issue are to use a different energy storage technology, or hybrid vehicle technology. The goal of the former is to find a method of storing electrical energy on board the car, in a manner more efficient than in a battery or capacitor. One proposed solution is the hydrogen fuel cell vehicle, which uses a hydrogen-based fuel cell to produce electricity while consuming hydrogen stored in a pressurized tank. This arrangement brings its own problems to the issue; cryogenic, compressed storage of hydrogen gas does not provide the energy density required to overcome gasoline as an onboard energy source; hydrogen infrastructure allows for quick refueling of hydrogen vehicles, but lags behind gasoline and electricity in terms of available refueling locations. Alternative energy storage is fast becoming the norm for achieving fuel efficiency without sacrificing range and performance. The most common example of synergy in the area of electric vehicles today is found in hybrid cars, vehicles which use a small auxiliary gasoline or diesel engine to provide performance beyond that of what their electric drivetrains can provide when necessary, as well as eliminating the concern of having to find a charging station to replenish the car's batteries (most currently available hybrid cars are not plug-in hybrids), since it is much easier to find a gasoline refueling station today. In turn, the electric drivetrain can be seen to be assisting the ICE in delivering the greatest possible range and performance from each gallon of fuel consumed. Regenerative braking and other forms of energy management help hybrid and electric cars fulfill this goal. Cars that make use of electrical power in conjunction with another means of propulsion (often an ICE powered by fossil fuel) are known as hybrid electric cars. Most hybrid cars are not considered pure electrical vehicles because they operate in a charge-sustaining mode. A hybrid vehicle that can operate purely on electrical power becomes an EV when it enters its charge-depleting mode. Hybrid vehicles that can charge their batteries from an external source in the same fashion as electric vehicles are called plug-in hybrid electric vehicles (PHEVs). Electric car operating costs can be directly compared to the equivalent operating costs of a gasoline-powered vehicle. The energy generated by complete combustion of 1 liter gasoline is about . Accounting for inefficiencies of gasoline vs. electric engines and transmission and battery losses, 1 liter gasoline is equivalent to from batteries.Given the Tesla Roadster's plug-to-wheel mileage of 280 Wh / mile and an arbitrary electricity price of $0.10 / kWh, driving a Tesla Roadster 40 miles a day would cost $1.12. For comparison, driving an internal combustion engine-powered car the same 40 miles, at a mileage of 25 mpg, would use 1.6 gallons of fuel and, at a cost of $3 / gallon, would cost $4.80. This is approximately 4 times more expensive than charging the electric car. This cost advantage varies depending on the costs of gasoline and electricity, the mileages of the vehicles, and the type of driving being considered. The cost advantage of electric cars increases in start-and-stop city driving because the regenerative braking systems of the newer electric cars recapture much of the kinetic energy of the moving vehicle and use this to recharge the batteries upon braking. This cannot be done for gasoline powered vehicles, and this energy is lost as heat. By contrast, during highway driving, most of the energy used to move the car forward is dispersed through wind resistance, which is not recoverable. In this case, gasoline powered cars compare more favorably with electric cars. The Tesla uses about , the EV1 used about . Servicing costs are lower for an electric car. The documentary film Who Killed the Electric Car? shows a comparison between the parts that require replacement in a gasoline powered cars and EV1s, with the garages stating that they bring the electric cars in every , rotate the tires, fill the windshield washer fluid and send them back out again. Even the hydraulic brakes require less maintenance because regenerative braking itself also slows the vehicle, as it does with a hybrid. Electric cars using lead-acid batteries require their regular replacement, while with routine maintenance internal combustion engines can last the lifetime of the vehicle. NiMH batteries typically last the life of the vehicle. Toyota Prius vehicles have been known to go over without needing a battery replacement, though the Toyota warranty is for 10 years/ or 8 years/ , and new batteries cost around $2,300 to $2,600 in 2008 and are expected to fall in price over time. Proponents of electric cars usually tout an increased efficiency as the primary advantage of an electric vehicle as compared to one powered by an internal combustion engine. The energy efficiency comparison is difficult to make because the two vehicles operate on different principles. Vehicles powered by internal combustion engines operate convert energy stored in fossil fuels to mechanical energy through the use of a heat engine. Heat engines operate with very low efficiencies because heat cannot be converted directly into mechanical energy. Electric vehicles convert stored electric potential into mechanical energy. Electricity can be converted into mechanical energy at very high efficiencies. A quick analysis will show electric vehicles are significantly more efficient. However, electricity (in a form usable for humans) does not naturally exist in nature. The electricity used for electric cars may be created by converting fossil fuels to electricity using a heat engine (with a similar efficiency as an automotive engine), converting nuclear energy to electricity using a heat engine, or through dams, windmills, or solar energy. Each of these conversion processes operate with less than 100% efficiency and those involving heat engines operate at relatively low efficiencies. When comparing the efficiencies of an electric vehicle to a gasoline vehicle, the efficiency of the source of generating the electric energy must be included in the comparison. For example, it may be incorrect to say that an electric vehicle charged each night from a gasoline powered generator is more efficient than a gasoline powered vehicle. An electric car's efficiency is affected by its battery charging and discharging efficiencies, which ranges from 70% to 85%, and its engine and braking system. The electricity generating system in the US loses 9.5% of the power transmitted between the power station and the socket, and the power stations are 33% efficient in turning the calorific value of fuel at the power station to electrical power. Overall this results in an efficiency of 20% to 25% from fuel into the power station, to power into the motor of the grid-charged EV, comparable or slightly better than the average 20% efficiency of gasoline-powered vehicles in urban driving, though worse than the about 45 % of modern Diesel engines running under optimal conditions (e.g. on motorways). However, well-to-wheel efficiency of gasoline and diesel engine would be lower when energy used in oil drilling, transporting and processing is included. Production and conversion electric cars typically use 10 to 23 kW·h/100 km (0.17 to 0.37 kW·h/mi). Approximately 20% of this power consumption is due to inefficiencies in charging the batteries. Tesla Motors indicates that the vehicle efficiency (including charging inefficiencies) of their lithium-ion battery powered vehicle is 12.7 kW·h/100 km (0.21 kW·h/mi) and the well-to-wheels efficiency (assuming the electricity is generated from natural gas) is 24.4 kW·h/100 km (0.39 kW·h/mi). The US fleet average of of gasoline is equivalent to 96 kW·h/100 km (1.58 kW·h/mi), and the Honda Insight uses 32 kW·h/100 km (0.52 kW·h/mi) (assuming 9.6 kW·h per liter of gasoline). The waste heat generated by an ICE is frequently put to beneficial use by heating the vehicle interior. Electric vehicles generate very little waste heat and electric heaters may have to be used to heat the interior of the vehicle if heat generated from battery charging/discharging can not be used to heat the interior. Electric vehicles used in cold weather will show increased energy consumption and decreased range on a single charge. The trade-off for range against cruising speed is well known for vehicles with internal combustion engines. Typically a cruising speed of around is near-optimal, although for specific cars it could fall as low as , or as high as . For electric vehicles the equation is less complex, and maximum range is achieved at comparatively low speeds. Whilst electric cars produce no emissions at the tailpipe— indeed they don't have one— their use increases demand for electrical generation. Generating electricity and producing liquid fuels for vehicles are different categories of the energy economy, with different inefficiencies and environmental harms, but both emit carbon dioxide into the environment. The well-to-wheel (WTW) carbon dioxide ( ) emissions of electric cars are always lower than those of conventional cars, but the amount of savings depend on the emissions intensity of the existing electricity infrastructure. An electric car's WTW emissions are much lower in a country like Canada, which electricity supply is dominated by hydro and nuclear, than in countries like China and the US that rely heavily on coal. An EV recharged from the existing US grid electricity emits about 115 grams of per kilometer driven (6.5 oz( )/mi), whereas a conventional US market gasoline powered car emits . The savings are questionable relative to hybrid or diesel cars, (according to official British government testing the most efficient European market cars are well below 115 grams of per kilometer driven), but would be more significant in countries with cleaner electric infrastructure. In a worst case scenario where incremental electricity demand would be met exclusively with coal, a 2009 study conducted by the WWF, World Wildlife Foundation, and IZES found that a mid-size EV would emit roughly , compared with an average of for a gasoline powered compact car. This study concluded that introducing 1 million EV cars to Germany would, in the best case scenario, only reduce emissions by 0.1%, if nothing is done to upgrade the electricity infrastructure or manage demand. According to the US Department of Energy, most electricity generation in the United States is from fossil sources, and half of that is from coal. Coal is more carbon-intensive than oil. Overall average efficiency from US power plants (33% efficient) to point of use (transmission loss 9.5%) is 30%. Accepting a 70% to 80% efficiency for the electric vehicle gives a figure of only around 20% overall efficiency when recharged from fossil fuels. That is comparable to the efficiency of an internal combustion engine running at variable load. The efficiency of a gasoline engine is about 16%, and 20% for a diesel engine. This is much lower than the efficiency when running at constant load and optimal rotational speed, which gives efficiency around 30% and 45% respectively. The electric battery suffers from similar decrease in efficiency when running at variable load, which accounts for the modest increased efficiency of hybrid vehicles.The actual result in terms of emissions depends on different refining and transportation costs getting fuel to a car versus a power plant. Diesel engines can also easily run on renewable fuels, biodiesel, vegetable oil fuel, with no loss of efficiency. Using fossil based grid electricity substantially negates the in-vehicle efficiency advantages of electric cars. The major potential benefit of electric cars is to allow diverse renewable electricity sources to fuel cars. According to the US Department of Energy, emissions for electricity generated from coal result in of per kW·h or roughly . emissions from electricity produced from all types of fuel using the mix of sources in the US as of 2008 results in of per kW·h or from an electric vehicle with a energy consumption (typical). Gasoline used in Internal Combustion Engine automobiles produces directly and an undetermined amount of in refining the crude oil, and transporting the gasoline to retail point of sale. With a US fleet average of in 2008, this would indicate a production of driven. Electric powered automobiles, even using the most intensive coal produced electricity, produce half the emissions of gasoline powered automobiles. If solar, wind, hydro, or nuclear electric generation, or carbon capture for fossil fuel powered plants were to become prevalent, electric vehicles could produce less , potentially zero. Based on GREET simulations, electric cars can achieve up to 100% reductions with renewable electric generation, against 77% with a B100 car. At present only a 32% reduction of is available for electric cars recharging from non-renewable utilities on the US Grid, because of the majority use of fossil fuels in generation, and inefficiency in the grid itself. The Ontario Medical Association announced that smog is responsible for an estimated 9,500 premature deaths in the province each year. Electric cars or plug-in hybrids, especially in emission-free electric mode, could vastly reduce this number. Although some electric vehicles have very small motors, or less and therefore have modest acceleration, the relatively constant torque of an electric motor even at very low speeds tends to increase the acceleration performance of an electric vehicle for the same rated motor power. Another early solution was American Motors’ experimental Amitron piggyback system of batteries with one type designed for sustained speeds while a different set boosted acceleration when needed. For example, the Venturi Fetish delivers supercar acceleration despite a relatively modest 220 kW (295 hp), and top speed of around . Some DC motor-equipped drag racer EVs, have simple two-speed transmissions to improve top speed. The Tesla Roadster prototype can reach in 4 seconds with a motor rated at . Great effort is taken to keep the mass of an electric vehicle as low as possible, in order to improve the EV's range and endurance. Despite these efforts, the high density and weight of the electric batteries usually results in an EV being heavier than a similar equivalent gasoline vehicle leading to less interior space, worse handling characteristics, and longer braking distances. However, in a collision, the occupants of a heavy vehicle will, on average, suffer fewer and less serious injuries than the occupants of a lighter vehicle; therefore, the additional weight brings safety benefits despite having a negative effect on the car's performance. An accident in a vehicle will on average cause about 50% more injuries to its occupants than a vehicle. In a single car accident, and for the other car in a two car accident, the increased mass causes an increase in accelerations and hence an increase in the severity of the accident.Some electric cars use low rolling resistance tires, which typically offer less grip than normal tires. Electric cars produced much less roadway noise as compared to vehicles propelled by a internal combustion engine. However, the reduced noise level from electric engines may not be beneficial for all road users, as blind people or the visually-impaired consider the noise of combustion engines a helpful aid while crossing streets, hence electric cars and hybrid could pose an unexpected hazard. Tests have shown that this is a valid concern, as vehicles operating in electric mode can be particularly hard to hear below for all types of road users and not only the visually-impaired. At higher speeds the sound created by tire friction and the air displaced by the vehicle start to make more audible noise. The US Congress and the European Commission are exploring legislation to establish a minimum level of sound for electric and hybrid electric vehicles when operating in electric mode, so that blind people and other pedestrians and cyclists can hear them coming and detect from which direction they are approaching. While heating can be simply provided with an electric resistance heater, higher efficiency and integral cooling can be obtained with a reversible heat pump (this is currently implemented in the hybrid Toyota Prius). Positive Temperature Constant (PTC) junction cooling is also attractive for its simplicity - this kind of system is used for example in the Tesla Roadster. However some electric cars, for example the Citroën Berlingo Electrique, use an auxiliary heating system (for example gasoline-fueled units manufactured by Webasto or Eberspächer). Cabin cooling can be augmented with solar power, most simply and effectively by inducting outside air to avoid extreme heat buildup when the vehicle is closed and parked in the sunlight (such cooling mechanisms are available as aftermarket kits for conventional vehicles). Two models of the 2010 Toyota Prius include this feature as an option. Using regenerative braking, a feature which is present on many electric and hybrid vehicles, estimates of 71-93% of the energy used to accelerate the mass of the vehicle may be recovered during braking, increasing its efficiency, particularly in urban drive cycles. Rechargeable battery materials used in electric vehicles include lead-acid ("flooded" and VRLA), NiCd, nickel metal hydride, lithium-ion, Li-ion polymer, and, less commonly, zinc-air and molten salt. 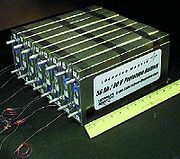 The Lithium iron phosphate battery is currently one of the most promising electric vehicle battery variants due to its light weight, high energy density, and lack of thermal runaway issues that have plagued laptop computer lithium-ion batteries. The amount of electricity stored in batteries is measured in ampere hours or coulombs, with the total energy often measured in watt hours. Historically, EVs and PHEVs have had issues with high battery costs, limited range between battery recharging, charging time, and battery lifespan, which have limited their widespread adoption. Ongoing battery technology advancements have addressed many of these problems; many models have recently been prototyped, and a few future production models have been announced. Batteries in BEVs must be periodically recharged (see also Replacing, below).BEVs most commonly charge from the power grid (at home or using a street or shop charging station), which is in turn generated from a variety of domestic resources; such as coal, hydroelectricity, nuclear and others. Home power such as roof top photovoltaic solar cell panels, micro hydro or wind may also be used and are promoted because of concerns regarding global warming. Charging time is limited primarily by the capacity of the grid connection. A normal household outlet is between 1.5 kW (in the US, Canada, Japan, and other countries with 110 volt supply) to 3 kW (in countries with 220/240V supply). The main connection to a house might be able to sustain 10 kW, and special wiring can be installed to use this. At this higher power level charging even a small, 7 kW·h (22–45 km) pack, would probably require one hour. This is small compared to the effective power delivery rate of an average petrol pump, about 5,000 kW. Even if the supply power can be increased, most batteries do not accept charge at greater than their charge rate ("1C"), because high charge rates have an adverse effect on the discharge capacities of batteries. In 1995, some charging stations charged BEVs in one hour. In November 1997, Ford purchased a fast-charge system produced by AeroVironment called "PosiCharge" for testing its fleets of Ranger EVs, which charged their lead-acid batteries in between six and fifteen minutes. In February 1998, General Motors announced a version of its "Magne Charge" system which could recharge NiMH batteries in about ten minutes, providing a range of . In 2005, mobile device battery designs by Toshiba were claimed to be able to accept an 80% charge in as little as 60 seconds. Scaling this specific power characteristic up to the same 7 kW·h EV pack would result in the need for a peak of 340 kW from some source for those 60 seconds. It is not clear that such batteries will work directly in BEVs as heat build-up may make them unsafe. Altairnano's NanoSafe batteries can be recharged in several minutes, versus hours required for other rechargeable batteries. A NanoSafe cell can be charged to around 95% charge capacity in approximately 10 minutes. Many people do not always require fast recharging because they have enough time, 30 minutes to six hours (depending on discharge level) during the work day or overnight to recharge. The charging does not require attention so it takes only a few seconds of the owner's time for plugging and unplugging the charging source. Many BEV drivers prefer recharging at home, avoiding the inconvenience of visiting a charging station. Some workplaces provide special parking bays for electric vehicles with chargers provided - sometimes powered by solar panels. In colder areas such as Finland, some northern US states and Canada there already exists some infrastructure for public power outlets, in parking garages and at parking meters, provided primarily for use by block heaters and set with circuit breakers that prevent large current draws for other uses. The charging power can be connected to the car in two ways using an (electric coupling). The first is a direct electrical connection known as conductive coupling. This might be as simple as a mains lead into a weatherproof socket through special high capacity cables with connectors to protect the user from the high voltage ; several standards, such as SAE J1772 and IEC 62196, cohabit. The second approach is known as inductive charging. A special 'paddle' is inserted into a slot on the car. The paddle is one winding of a transformer, while the other is built into the car. When the paddle is inserted it completes an electromagnetic circuit which provides power to the battery pack.In one inductive charging system, one winding is attached to the underside of the car, and the other stays on the floor of the garage. The major advantage of the inductive approach is that there is no possibility of electric shock as there are no exposed conductors, although interlocks, special connectors and RCD (ground fault detectors) can make conductive coupling nearly as safe. However there is no reason that conductive coupling equipment cannot take advantage of the same concept. Conductive coupling equipment is lower in cost and much more efficient due to a vastly lower component count. An inductive charging proponent from Toyota contended in 1998 that overall cost differences were minimal, while a conductive charging proponent from Ford contended that conductive charging was more cost efficient. Lead acid batteries are still the most used form of power for most of the electric vehicles used today. The initial construction costs are significantly lower than for other battery types, and while power output to weight is poorer than other designs, range and power can be easily added by increasing the number of batteries. Manufacturers are not using these batteries in new designs because of the greater maintenance costs compared with solid batteries and the weight and bulk which affects the handling and space of the vehicle. They are the prinicpal form of battery in non-road going electric vehicles such as mobility scooters and electric forklifts. Most non-commercial conversions generally have a range of . Production EVs with lead-acid batteries are capable of up to per charge. NiMH batteries have higher energy density and may deliver up to of range. The lithium-ion battery in the AC Propulsion tzero provides of range per charge. The list price of this vehicle when it was released in 2003 was $220,000. Lithium is also less expensive than nickel. Finding the economic balance of range against performance, battery capacity versus weight, and battery type versus cost challenges every EV manufacturer. An alternative to quick recharging is simply to exchange the drained or nearly drained batteries (or battery range extender modules) with fully charged batteries, rather as stagecoach horses were changed at coaching inns. Batteries could be leased or rented instead of bought, and then maintenance deferred to the leasing or rental company, and ensures availability (see Think Nordic). In 1947, in Nissan's first electric car, the batteries were removable so that they could be replaced at filling stations with fully charged ones. The company Better Place is one potential player in this market - however they neither rent nor lease the batteries, using them as a means to an end to sell kilometers/miles to customers the have a contract with. Renault announced at the 2009 Frankfurt Motor Show that they have sponsored a network of charging stations and plug-in plug-out battery swap stations. Other vehicle manufacturers and companies are also investigating the possibility. BEVs (including buses and trucks) can also use genset trailers and pusher trailers to extend their range without the additional weight during normal short-range use. Drained battery set trailers can be replaced by charged ones along a route. Such BEVs can become hybrid vehicles depending on the trailer's and car's types of energy and powertrain. Replaceable batteries were used in the electric buses at the 2008 Summer Olympics. Zinc-bromine flow batteries or Vanadium redox batteries can be refilled, instead of recharged, saving time. The depleted electrolyte can be recharged at the point of exchange, or taken away to a remote station. During peak load periods, when the cost of electricity can be very high. These vehicles can then be recharged during off-peak hours at cheaper rates while helping to absorb excess night time generation. Here the batteries in the vehicles serve as a distributed storage system to buffer power. During blackout, as an emergency backup supply. The basic premise here is similar to Economy 7 in the United Kingdom: incentives to spread the load more evenly across the day reduces the need for expensive peak demand and thus the need to building power stations that can supply it on demand. Individual batteries are usually arranged into large battery packs of various voltage and ampere-hour capacity products to give the required energy capacity. Battery life should be considered when calculating the extended cost of ownership, as all batteries eventually wear out and must be replaced. The rate at which they expire depends on a number of factors. The depth of discharge (DOD) is the recommended proportion of the total available energy storage for which that battery will achieve its rated cycles. Deep cycle lead-acid batteries generally should not be discharged below 80% capacity. More modern formulations can survive deeper cycles. Jay Leno's 1909 Baker Electric still operates on its original Edison cells. Battery replacement costs of BEVs may be partially or fully offset by the elimination of some regular maintenance, such as oil and filter changes required for ICEVs, and by the greater reliability of BEVs due to their fewer moving parts. They also do away with many other parts that normally require servicing and maintenance in a regular car, such as on the gearbox, cooling system, and engine tuning. And by the time batteries do finally need definitive replacement, they can be replaced with later generation ones which may offer better performance characteristics, in the same way one might replace an old laptop or mobile phone battery. Firefighters and rescue personnel receive special training to deal with the higher voltages and chemicals encountered in electric and hybrid electric vehicle accidents. While BEV accidents may present unusual problems, such as fires and fumes resulting from rapid battery discharge, there is apparently no available information regarding whether they are inherently more or less dangerous than gasoline or diesel internal combustion vehicles which carry flammable fuels. Lithium-ion batteries can overheat due to short circuiting or crash damage. One in every 60,000 electric cars could experience a problem due to a lithium ion cell overheating. A failure of one cell could spread to other cells within the battery. Even if battery fires were no more widespread than fires associated with gasoline cars, negative portrayals in the mass media could prove detrimental to the transition to electric vehicles. The future of battery electric vehicles depends primarily upon the cost and availability of batteries with high energy densities, power density, short charge time and long life, as all other aspects such as motors, motor controllers, and chargers are fairly mature and cost-competitive with internal combustion engine components. Li-ion, Li-poly and zinc-air batteries have demonstrated energy densities high enough to deliver range and recharge times comparable to conventional vehicles. By the year 2020, an estimated 30% of the cars driving on the road will be battery, electric or plug-in hybrid. Bolloré, a French logistics conglomerate, developed a concept car, called the Bluecar, using Lithium-ion polymer batteries developed by a subsidiary, Batscap. It had a range of and top speed of . The cathodes of early 2007 lithium-ion batteries are made from lithium-cobalt metal oxide. That material is expensive, and can release oxygen if its cell is overcharged. If the cobalt is replaced with iron phosphates, the cells will not burn or release oxygen under any charge. The price premium for early 2007 hybrids is about $5000 US, some $3000 of which is for their NiMH battery packs. At early 2007 gasoline and electricity prices, that would break even after six to ten years of operation. The hybrid premium could fall to $2000 in five years, with $1200 or more of that being cost of lithium-ion batteries, breaking even after three years. EEStor claims to have developed a supercapacitor for electricity storage. These units are titanate coated with aluminum oxide and glass to achieve a level of capacitance claimed to be much higher than that currently available on the market. The claimed energy density is 1.0 MJ/kg whereas existing commercial supercapacitors typically have an energy density of around 0.01 MJ/kg, while lithium-ion batteries have an energy density of around 0.59 MJ/kg to 0.95 MJ/kg). EEStor claims that a 5 minute charge should give the supercapacitor enough energy to give a car a range of . Solar cars are electric cars that derive most or all of their electricity from built in solar panels. After the 2005 World Solar Challenge established that solar race cars could exceed highway speeds, the specifications were changed to provide for vehicles that with little modification could be used for transportation. In 2008 Australia started producing its first commercial all-electric vehicle. Originally called the Blade Runner, its name was changed to Electron, and is already being exported to New Zealand with one purchased by the Environment Minister Dr. Nick Smith. The Electron is based on the Hyundai Getz chassis and has proven popular with government car pools. British Columbia is the only place where it is legal to drive a LSV electric car on public roads, although it also requires low speed warning marking and flashing lights. Quebec is allowing LSVs in a three year pilot project. These cars will not be allowed on the highway, but will be allowed on city streets. The Chinese government adopted a plan with the goal of turning the country into one of the leaders of all-electric and hybrid vehicles by 2012. The government's intention is to create a world-leading industry that will produce jobs and exports, and to reduce urban pollution and its oil dependence. However, a study found that even though local air pollution would be reduced by replacing a gasoline car with a similar-size electric car, it would reduce greenhouse gas emissions by only 19%, as China uses coal for 75% of its electricity production. A 19% reduction is, however, a substantial reduction and all cars being electric would be a larger incentive not only for more investment in renewable electricity generation, but also make a home solar system more economical. The government is providing subsidies for electric car research and also subsidies of up to $8,800 US for each hybrid or all-electric vehicle purchased by taxi fleets and local government agencies in 13 Chinese cities. Electricity utilities have been ordered to set up electric car charging stations in Beijing, Shanghai and Tianjin . China wants to raise its annual production capacity to 500,000 hybrid or all-electric cars and buses by the end of 2011, from 2,100 in 2008. As intercity driving is rare in China, electric cars provide several practical advantages because commutes are fairly short and at low speeds due to traffic congestion. These particular local conditions make the range limitation of all-electric cars less of a problem, especially as the latest Chinese models have a top speed of and a range of between charges. A small city car called XD assembled by croatian company DOK-ING. The name XD comes from oddly shaped rear lights ("X" shaped) and "D" beginning letter of the company's name. XD can travel over 250 km on a single charge with Lithium-ion batteries. Car's base-cost will be only 10.000€. Serial production is predicted to start mid-2010. There is a lot of knowledge about electric cars in Finland, with companies such as Valmet Automotive (Fisker Karma and Garia A/S electric golf cart production) and also agreement of Think City car productiction), Fortum (concept cars and infrastructure), Kabus (hybrid buses; part of Koiviston Auto Oy), BRP Finland (part of Bombardier Recreational Products), Lynx , Patria (military vehicles), European Batteries (Li-ion battery plant in Varkaus ), Finnish Electric Vehicles (battery control systems), ABB, Efore, Vacon (electric motor technology production), Ensto (production of charging units), Elcat (electric vehicle production since the 1980s), production of electric car accessories, Suomen Sähköauto Oy (produces small electric cars), Oy AMC Motors Ltd. (produces and designs small electric cars), Raceabout (specialist electric sport car with very few sales), Gemoto skooters from Cabotec, Resonate's Gemini and Janus Scooters. There is also a non-commercial electric car conversion organisation called Electric Cars - Now! that converts standard Toyota Corollas into Li-ion battery-powered electric cars. As of August 2009, more than 1,700 pre-orders for conversion Toyotas have been placed. The speciality in the Electric Cars - Now! project is that it is an open source project: anyone can start similar production anywhere they want, the benefits for the customer being open-source spare part coding and so on. The ideas and design are freely available from the Electric Cars - Now! organisation. Sharing knowledge is also in progress: in Helsinki the Electric Motor Show 2009 will be held from 6 to 8 November. The show will feature only cars, motorcycles, scooters, mopeds and microcars and components for them. The plan is to hold the show annually. Basic charging infrastructure is already available all over Finland, used for engine pre-warming in the cold winters. Because of its climate – cold winters and warm summers – Finland is considered a convenient "test laboratory" for electric cars and many companies have made field tests in Finland. It has been said in Autobild 08/09 magazine that Fortum is developing the high-speed charging system. With a new kind of three-phase charging method electric cars can be charged in four minutes. A commercial product should be ready by 2011. There are also mines and metal refineries for lithium alloy in Finland. At the moment there are several mining projects under way such as the Keliber project. There are several electric car organisations in Finland, such as the Electric Vehicle Association of Finland and Electric Vehicles Finland. France's largest energy provider, EDF is currently working with Toyota to develop charging stations throughout France. Toyota is also leasing a fleet of 100 plug-in hybrid vehicle through selected partners in France. Iceland is officially planning to convert all vehicles in the country to electric by 2012, the first to do so. Shai Agassi, CEO of Better Place, has reached agreements with Renault-Nissan and the government to begin the first phases of the company’s efforts to make Israel the world’s first integrated electric car network. Better Place, whose aim is to reduce global dependency on oil by creating an infrastructure to support the implementation of a worldwide network of electric vehicles, was started in 2007 with the encouragement of President Shimon Peres. Israel is considered a viable site for this groundbreaking endeavor due to the country’s relatively small size and the fact that approximately 90% of the nation’s car owners drive less than a day. Agassi has designed an infrastructure consisting of 500,000 charging stations and almost 200 battery-exchange stations. In December 2008, Better Place revealed its first plug-in parking lot in Tel Aviv . Additionally, in May 2009, the company unveiled its patented battery swap system, which is designed for drivers taking longer road trips who lack the time needed to recharge their own battery. Better Place has currently opened 17 of the 150,000 charging stations planned for Israel by 2011. In mid 2009, Mitsubishi and Subaru respectively released electric cars for corporate lease in Japanese market, for price range of approximately US$32,000-34,000 (government tax relief and subsidy inclusive). Mitsubishi plans to extend it for consumer use in 2010. Nissan also announced its plan for the electric car "Leaf" in 2010. Poland is developing charging station infrastructure in Gdansk , Katowice , Krakow , Mielec and Warsaw . Funds for the project come from the European Union. The biggest organization in Poland in the area of electric vehicles is Klaster Green Stream. The Polish company (3xE - electric cars) offer electric vehicle conversions of small city cars such as the Smart ForTwo, Citroën C1, Fiat Panda, Peugeot 107, Audi A2. The converted cars have a range of about , using lithium iron phosphate batteries and brushless DC electric motors, and the conversion can cost less than €12,000. Portugal has also reached agreements with French car maker Renault and its Japanese partner Nissan to boost the use of electric cars by creating a national recharging network.The aim is to make Portugal one of the first countries to offer drivers nationwide charging stations. On 8 September 2009 the Spanish Industry Minister Miguel Sebastián Gascón announced that in late 2010 electric cars will be relisted in Spain . Madrid , Barcelona and Seville will provide charging points. Speaking at the G8 summit in 2008, British Prime Minister Gordon Brown announced plans for Britain to be at the forefront of a "green car revolution". Brown suggested that by 2020 all new cars sold in Britain could be electric or hybrid vehicles producing less than . In preparation for the introduction of mass-produced electric vehicles to Britain's roads, trials of electric cars are taking place from 2009, with further trials in cities across the UK from 2010. Local British councils are being invited to submit bids to become Britain's first "green cities". One example is Glasgow , where a Scottish consortium has been awarded more than £1.8m to run a pilot electric car scheme from 2009-11. In January 2009, transport secretary Geoff Hoon said the British government would make £250m available for consumer incentives to bring electric cars to market in the UK.Nissan's Sunderland plant — the largest car factory in the UK — has been granted a £380m EU-backed loan to develop electric car technology. This will potentially generate 4,500 jobs and make the North-East of England a major producer of electric cars. London mayor Boris Johnson has also announced plans to deliver 25,000 electric car-charging places across the capital by 2015, in order to make London the "electric car capital of Europe". His target is to get 100,000 electric vehicles on to London's streets. Mr Johnson has also pledged to convert at least 1,000 Greater London Authority fleet vehicles to electric by 2015. There has been criticism that although electric vehicles are available, places to charge them are not. In April 2009, the UK Government set out plans to offer subsidies of up to £5,000 to encourage them to buy electric or plug-in hybrid cars. However, these subsidies are not expected to be available until there is a "mass market" in "around 2011". In a separate Budget initiative, in April 2009 the UK Chancellor of the Exchequer Alistair Darling detailed a £2,000 subsidy for scrapping a vehicle ten years old or more and buying an electric or hybrid vehicle. On 30 April 2009, the Electric Car Corporation put on sale the Citroën C1 ev'ie, an adapted Citroën C1 intended for city driving. On that date, it had a list price of £16,850 ($24,989 US). On 19 November 2009, Andrew Adonis, the Secretary of State for Transport, announced a scheme called "Plugged-in-Places", making available £30 million to be shared between three and six cities to investigate further the viability of providing power supply for electric vehicles, and encouraging local government and business to participate and bit for funds. Since the late 1980s, electric vehicles have been promoted in the US through the use of tax credits. Electric cars are the most common form of what is defined by the California Air Resources Board (CARB) as zero emission vehicle (ZEV) passenger automobiles, because they produce no emissions while being driven. By 2015, President Obama set a goal for the United States to have one million electric vehicles driving on the road.Palm, Erik. "Study: Electric cars not as green as you think." Cnet News. N.p., 1 May 2009. Web. 5 Oct. 2009. /climaterealists.com/index.php?id=3947 > The CARB had set progressive quotas for sales of ZEVs, but most were withdrawn after lobbying and a lawsuit by auto manufacturers complaining that EVs were economically infeasible due to an alleged "lack of consumer demand". Many of these lobbying influences are discussed in the documentary film Who Killed the Electric Car?. The California program was designed by CARB to reduce air pollution and not specifically to promote electric vehicles. Under pressure from various manufactures, CARB replaced the zero emissions requirement with a combined requirement of a very small number of ZEVs to promote research and development, and a much larger number of partial zero-emissions vehicles (PZEVs), an administrative designation for a super ultra low emissions vehicle (SULEV), which emits about 10% of the pollution of ordinary low emissions vehicles and are also certified for zero evaporative emissions. While effective in reaching the air pollution goals projected for the zero emissions requirement, the market effect was to permit the major manufacturers to quickly terminate their electric car programs and crush the vehicles. In March 2009 Ford CEO Alan Mulally stated that in 10 to 12 years electric cars would be the dominant vehicle produced. An electric Ford Focus is expected in 2011. The chart and table are based on Department of Energy tables. (Table V1 and the Historical Data.) Figures for electric vehicles do not include privately owned vehicles, but do include Low-Speed Vehicles (LSVs), defined as "four-wheeled motor vehicles whose top speed is ... ... to be used in residential areas, planned communities, industrial sites, and other areas with low density traffic, and low-speed zones. "LSVs, more commonly known as neighborhood electric vehicles (NEVs), were defined in 1998 by the National Highway Traffic Safety Administration's Federal Motor Vehicle Safety Standard No. 500, which required safety features such as windshields and seat belts, but not doors or side walls. Short-range battery electric vehicles can offer the hobbyist comfort, utility, and quickness, sacrificing only range. Short-range EVs may be built using high-performance lead–acid batteries, using about half the mass needed for a range. The result is a vehicle with about a range, which, when designed with appropriate weight distribution (40/60 front to rear), does not require power steering, offers exceptional acceleration in the lower end of its operating range, and is freeway capable and legal. But their EVs are expensive due to the higher cost for these higher-performance batteries. By including a manual transmission, short-range EVs can obtain both better performance and greater efficiency than the single-speed EVs developed by major manufacturers. Unlike the converted golf carts used for neighborhood electric vehicles, short-range EVs may be operated on typical suburban throughways (where speed limits are typical) and can keep up with traffic typical on such roads and the short "slow-lane" on-and-off segments of freeways common in suburban areas. Faced with chronic fuel shortage on the Gaza Strip , Palestinian electrical engineer Waseem Othman al-Khozendar invented in 2008 a way to convert his car to run on 32 electric batteries. According to al-Khozendar, the batteries can be charged with $2 worth of electricity to drive from . After a 7-hour charge, the car should also be able to run up to a speed of . As electricity is supplied to Gaza by Israel , this may be seen not only as a way to combat climate changes and fuel shortage, but also as a way of making peace. Japanese Professor Hiroshi Shimizu from Faculty of Environmental Information of the Keio University created an electric limousine: the Eliica (Electric Lithium-Ion Car) has eight wheels with electric 55 kW hub motors (8WD) with an output of 470 kW and zero emissions, a top speed of , and a maximum range of provided by lithium-ion batteries. However, current models cost approximately $300,000 US, about one third of which is the cost of the batteries. In 2008, several Chinese manufacturers began marketing lithium iron phosphate batteries directly to hobbyists and vehicle conversion shops. These batteries offered much better power to weight ratios allowing vehicle conversions to typically achieve per charge. Prices gradually declined to approximately $350 US per kW·h by mid 2009. As the cells feature life ratings of 3,000 cycles, compared to typical lead acid battery ratings of 300 cycles, the life expectancy of cells is around 10 years. This has led to a resurgence in the number of vehicles converted by individuals. cells do require more expensive battery management and charging systems than lead acid batteries. Other types of green vehicles include vehicles that move fully or partly on alternative energy sources rather than fossil fuel. Another option is to use alternative fuel composition in conventional fossil fuel-based vehicles, making them go partly on renewable energy sources. Other approaches include personal rapid transit, a public transportation concept that offers automated on-demand non-stop transportation, on a network of specially-built guideways. There are electric cars available for purchase in one or more countries, or currently in mass production even if not yet delivered. There are also many electric car projects that are not yet available but are at an advanced stage of development. The following electric cars are currently in an advanced stage of development. Image:GM EV.jpg|The General Motors EV1 had a range of with NiMH batteries in 1999. Image:Toyota RAV 4 EV.jpg|The Toyota RAV4 EV is powered by twenty-four 12 volt batteries, with an operational cost equivalent of over at 2005 US gasoline prices. Image:Mitsubishi i MiEV background blurred.jpg|Mitsubishi i MiEV, sales planned for 2010. Image:G-Wiz_-2_28_07_2007_(932064472).jpg|The REVAi, also known as the G-Wiz i, is currently the world's top-selling battery electric car. It has a range of . Image:2002-2006_Hyundai_Getz_(TB)_GL_3-door_hatchback_01.jpg| Blade Electric Vehicles, 'Electron' (TM) (previously Blade Runner) is Australia's first commercial EV. "electric automobile." Encyclopaedia Britannica Online. N.p., n.d. Web. 5 Oct. 2009..
O'CONNELL, VP TESLA MOTORS, DIARMUID, DAN NEIL, and Dan Rather, hosts. "Electric Cars." DAN RATHER REPORTS GLOBAL CORRESPONDENT . CQ-Roll Call Group. 9 Sept. 2009. Gale Virtual Reference Library. Web. Transcript. 5 Oct. 2009. "1957 Porsche 356 Speedster Electric Conversion" uses batteries. NOW on PBS investigates if electric cars will bring a new global climate change plan.